Peel the hard boiled eggs, cut in half length-wise. Carefully empty the yolks and scoop out the avocado flesh into a small food processor (you can use a hand blender too). Add the Dill Dip. Puree until smooth. Spoon the mixture back into the egg white halves. Garnish with sprouts. Refrigerate or eat right away. Enjoy! 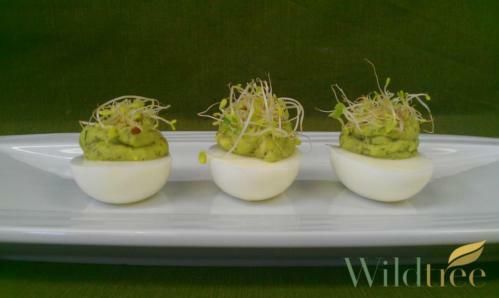 Whether for holiday appetizers or other special gathering, deviled eggs are always a hit! Preheat oven to 350°F. In a medium size bowl combine all of the ingredients until well combined. Transfer to a baking dish that allows about an inch of room from the top to prevent the dip from bubbling over. Bake for 30 minutes. Serve warm with chips. 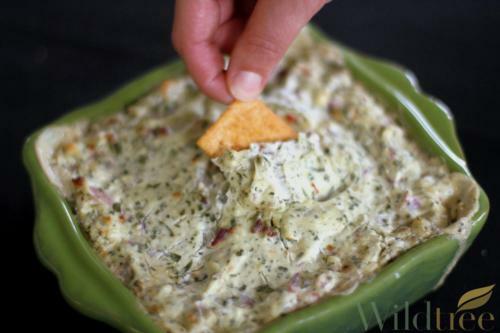 There is always room for a spinach dip in your holiday appetizers line up. Preheat oven to 400 degrees F. Make an egg wash by whisking together the egg and water; set aside. Lightly flour your working surface. Unfold the thawed sheet of puff pastry and roll into a 12 inch square. Trim the corners so they are rounded (save the scraps). Spread the desired Wildtree Jam/Spread over the puff pastry to within two inches of the edges. Sprinkle with almonds (optional); place the brie on top. Brush the edges of the pastry with the egg wash. Fold the pastry over the cheese to cover by bringing each edge over the cheese one at a time (similar to wrapping a gift). Place the cheese seam side down onto a greased baking sheet. Brush the entire pastry with egg wash. Decorate the top of the cheese using the pastry scraps; brush that with egg wash as well. Bake for 20 minutes or until the pastry is golden brown. Let stand for about 30 minutes. Serve with crackers if desired. Optional: Cut puff pastry and brie into bite size portions to make individual pieces. Combine all ingredients in a bowl; toss to coat the mushrooms. Marinate for 30 minutes. Preheat oven to 350°F or preheat grill. 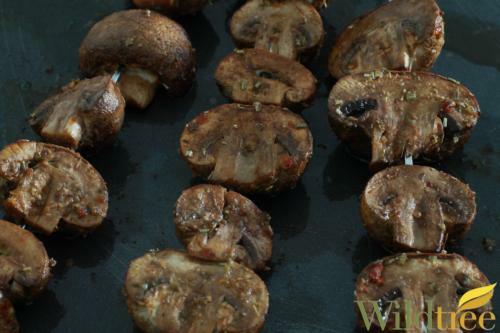 Thread the mushrooms onto skewers. Roast for 10-12 minutes, turning half way through, or grill for 5 minutes on each side. 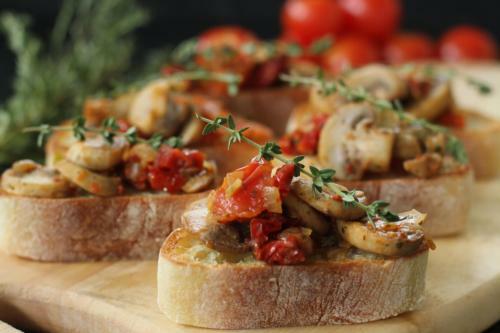 Quick and easy holiday appetizers are always popular. These marinated mushrooms fall into that category. Preheat oven to 350 degree F. Combine the crackers, butter, Scampi Blend, and lemon juice in a bowl and mix well. Add the seafood and mix. Arrange the mushroom caps on a baking sheet. Spoon the seafood mixture into the mushroom caps. Bake for 7 to 10 minutes or until heated through and light brown on top. Did you say quick and easy holiday appetizers. 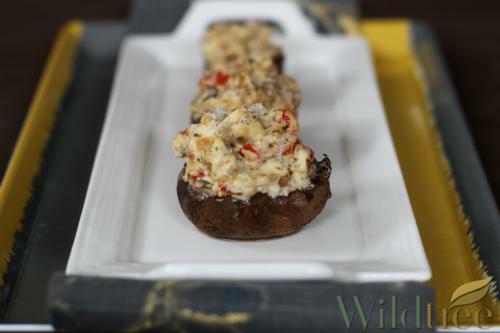 These stuffed mushrooms fit the bill. Preheat broiler; set rack to highest position. Slice baguette into 12 slices. Place on a baking sheet and brush each using 1 tablespoon of Grapeseed Oil; set aside. Heat the remaining 1 tablespoon of Grapeseed Oil in a medium nonstick skillet over medium to medium high heat. Add the onion and sauté until translucent. Add the mushrooms, stir to coat in the oil. Cook for about 7 minutes or until the mushrooms are tender. Add the sundried and cherry tomatoes, the Smoked Mozzarella Blend, cracked black pepper, and thyme. Continue cooking until the tomatoes are tender. Meanwhile, toast the baguette slices under the broiler for 1-2 minutes. Keep an eye on them because they will burn quickly. Remove from oven and top with the cooked mushroom mixture. Preheat oven to 350°F. Combine the ground chicken, ginger, scallions, and Teriyaki Sauce in a mixing bowl. Mix thoroughly. Remove and discard the stems from the mushrooms. Use a small spoon to remove the gills from the insides of the caps. Fill the caps with the chicken mixture. 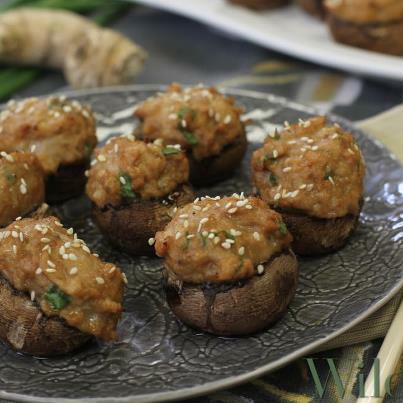 Place the mushrooms on a lightly greased or parchment lined baking sheet. Sprinkle the sesame seeds on top. Bake for 20-25 minutes or until the chicken is cooked through. Rest for 5 minutes before serving. 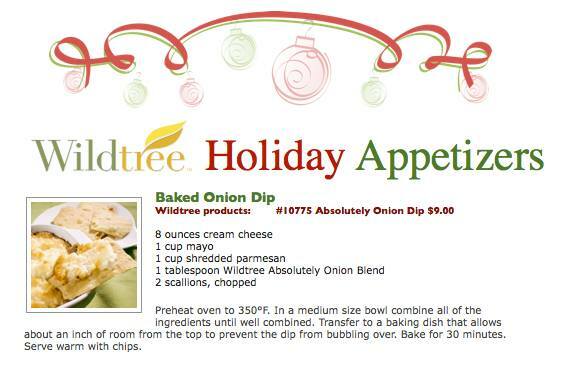 For more holiday appetizers recipes and/or shop for Wildtree products go to www.TheDinnerPlanMan.com. Wildtree offers the highest quality herbs, spices and culinary blends that are free of preservatives, additives, fillers and promote a healthier lifestyle. They believe in the value of making cooking a quicker, easier, more healthful project for those who are short on time. 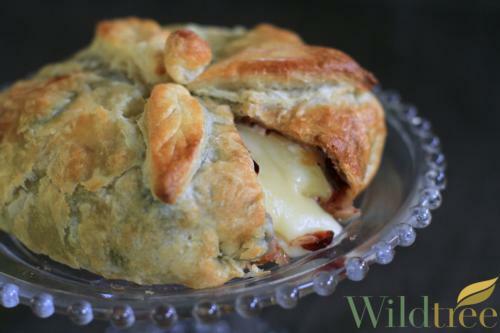 Wildtree also offers a fun adventure for those who wish to be more creative in the kitchen. Wildtree offers their representatives the opportunity to earn unlimited income and have a home based business that allows them to live the American Dream. Holiday appetizers. Holiday Appetizers. Holiday Appetizers.